Put a Little Piece of Antioxidant in Your Day!! If you drink a lot of water daily, but you are missing Green Tea(THE SUPER ANTIOXIDANT! ), NO PROBLEM. Our MIghTeaFlow Gum will do the trick!! 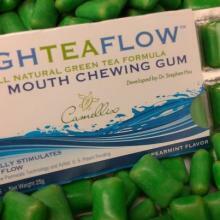 One piece of our flavorful gum=one cup of green tea in every delicious piece!! !